Are you trying to find the right Limestone Sealer Dallas solution for your set of stones, but you don’t know where to go? Perhaps you’re trying to figure out what needs to happen to keep your limestone in great condition for years to come and you’re unsure of what to do next. If you need the best products and professionals in the business to help you out, we’re here to provide you with answers and solutions. The TSSPRO Sealant is something you can depend on for years to come. 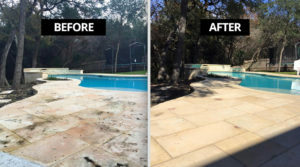 Our sister company in Texas, The Texas Stone Sealers, have years of experience helping customers clean, seal, and maintain their stone. After awhile of using some of the “best” and “big name” products to help us do our jobs, we became frustrated with the results. Some of the most trusted manufacturers in the business were selling us products that simply weren’t good enough. Everybody on our team was sick of dealing with low quality acrylic sealants that failed to get the job done. Once we all came to an agreement, we began putting our efforts into developing something that would make everybody happy. Not just us, but our customers as well. Today, we have a line of propriety sealants that we can be very proud of. The TSSPRO-100 was our first product to hit the shelves. Soon after that, our brand began to take off, and we ended up becoming a great hub for quality sealants for affordable prices. The pricing on all of our products is very accessible, and every sealant is commercial grade quality. You can depend on any of the TSSPRO-100 sealants to be good enough for your backyard pool deck. Trying to find a sealant that will cure quickly for your office complex? No problem; these all-natural and alcohol-based products will get the job done regardless of the environment. Limestone is one of the most common types of sedimentary rock on the planet. Made up of calcite, aragonite, and other materials, it contains many unique grains. These extra substances contain ancient shells from aquatic animals and marine organisms from years ago. This is one of the many reasons why limestone is such a unique and coveted type of stone. It has been used for hundreds of years, and customers still love the look of this material. Limestone is great for a medley of reasons, but it’s important to remember that it is also very porous. Because of this, you’re going to need to watch out for potential stains and scratches. If you have an unsealed pool deck or patio, you’re going to be very susceptible to damages. It’s important to make sure you seal your limestone because it makes it much harder to clean it without damaging it in the process. Bleach, vinegar, and abrasive scrubs and brushes can all cause lasting damage to your limestone if you don’t seal your stone beforehand. This is where our Limestone Sealer Dallas service comes in. There are many types of different sealants out there, and nearly all of them claim to be the best. This is something that many people get caught up in, and it can be very confusing picking the right one for you. Make the right choice by picking one of our TSSPRO sealants. These are all-natural, alcohol-based proprietary products that can get the job done at all times. The TSSPRO-200 is a great sealant to use if you’re trying to properly seal your limestone. It will provide your stone with a quality finish and a quick curing process. This is much like the TSSPRO-100, but it contains bigger molecules than its predecessor. It is an all-natural and alcohol-based product that will last your limestone for years to come. Pick this if you need a quality sealing. Are you worried about brown and black mold negatively affecting you? This is something that can really cause you to deal with discolorations on your surfaces. Unfortunately, this is common with limestone, but we can protect you from it. Using the TSSPRO-700CS sealant can help you prevent discolorations because of algae and mold. This is a high quality product that will seal your limestone and protect you from future stains. Our inventory is always growing, and it can be hard as a consumer to know what’s right for you. Don’t make the mistake of embarking on this venture alone. Instead, lean on our professionals to guide you through and help you make the best decision. Every surface is different. Whether you have a pool deck or a countertop, you’re going to need to make the right choices towards properly sealing it. Make sure you call us when you’re ready to find and develop a solution for your problems. Our team of experts can help you figure out what’s best for you. Don’t let your Limestone Sealer Dallas needs get the best of you. You’re probably trying to figure out the best type of treatment for your stone, and that’s totally understandable. If you need some assistance with finding the right solution for you, we’re here to help. Call us today at 888-958-0556 to receive a free consultation from our team. When you’ve got Texas Stone Sealers on your side, you’ll have the best sealant professionals in the Lone Star State helping you with your problems. Let’s start working towards a solution that makes sense for you and your stone. Dallas has a quickly growing population, and our city continues to thrive and improve as the years go by. There are a plethora of newspapers and magazines that cover our city. Our media coverage is vital to keeping other Texans and American aware of what’s going on in our city. Slavic Voice of America Media Group is a great asset to Dallas. With this, we’re able to provide information on what’s going in our city to Russians who don’t speak English. Thanks for the help, SVAMG!